The law or road safety rules does clarify that vehicles are to stop at pedestrian crossings to allow movement of people according to National Road Safety Council Morobe Manager Lucas Kintau. But the law does not demarcate whether you can access pedestrian crossing only in the day or night time hence it’s not illegal to access public crossings at anytime of the day according to Mr. Kintau. Mr. Kintau said unfortunately for Lae city the industrial hub of Papua New Guinea accessing public crossings at night time is too risky. He said whilst the law states the purpose of accessing pedestrian crossing, these facilities in Lae is unsafe during night time and the risk is there once anyone steps out of their homes. He said unlike Port Moresby, all Lae city public crossings don’t have traffic lights making it too risky to cross at nighttime. 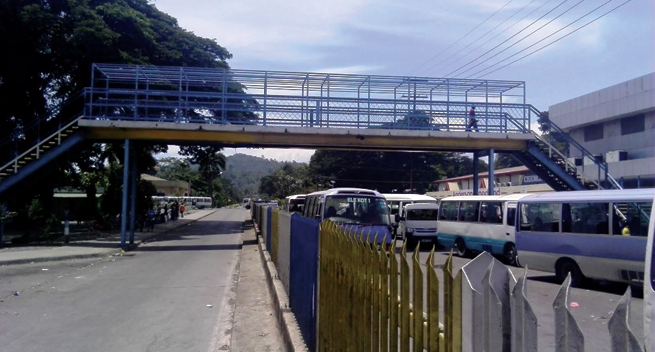 A concerned citizen of the city and Executive Officer of the Morobe Law and Justice Sector Francis Masiang reiterated that accessing public road crossings at night time in Lae city is risky. Mr. Masiang said at two instances he witnessed pedestrians almost run over by motorist in the night time solely blamed on public awareness of road safety standards and practices. Mr. Masiang further called on the NRSC to create more awareness to the public on the use of public crossings. He indicated that at the moment the never seen or no traffic light in the industrial hub of the country is dangerous for public. Mr. Masiang said he is submitting a report from the public perception to the NRSC and concerned authorities to seriously consider the plight of accessing pedestrian crossings at night. Mr. Kintau said the Department of Works is working on improving crossings in the city with new paintings. He said with the improved concrete city roads the city should also have improved crossing facilities. He added that the current scenario of the crossings in the city is risky and it all now comes down to common sense when accessing crossings. “Don’t use crossings in the night if you predict danger approaching or forthcoming, its common sense,” said Mr. Kintau.